Manuela Arciniegas is a drummer, songwriter, singer and dancer specializing in Afro-Dominican and Afro-Puerto Rican traditional music. She graduated from Harvard in 2001 and has been working in education, cultural arts and community organizing, since then. Manuela performs and teaches Afro-Puerto Rican and Afro-Dominican music with various troupes around NYC, including Yaya All-Women’s Drumming Troupe, Alma Moyo, La 21 Division, Kumba Carey, Grupo Kalunga Neg Mawon, Nchila Ngoma, and William Cepeda’s Afro-Boricua. She has performed at Symphony Space, The Apollo Theater, Lincoln Center of out Doors, and Queens Theater in the Park. She is the recipient of the 2008 Urban Artist Initiative and the Founder, Director, and Program Coordinator of The Legacy Circle, a nonprofit she in 2005. 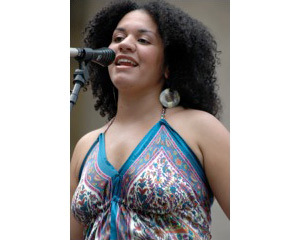 Manuela is currently pursuing a PhD in Ethnomusicology at the CUNY Graduate Center.